This entry was posted in Misc Buildings, Misc Roads by Picture Stockton Team. Bookmark the permalink. A 1952 & 1962 map shows them as (left to right) Saltville, Hutton House & Wylam House. The buildings to the left would be the Vicarage. Behind the row of houses might be the gable end of the Parish Hall. In front and to the right of the row is the railway line that passed under the road at this point, the brick wall at one end of the underpass can be seen, the other end being out of shot to he left. A seemingly simple picture, with many points of interest, shipyard, Furness estate, railway lines and community buildings. 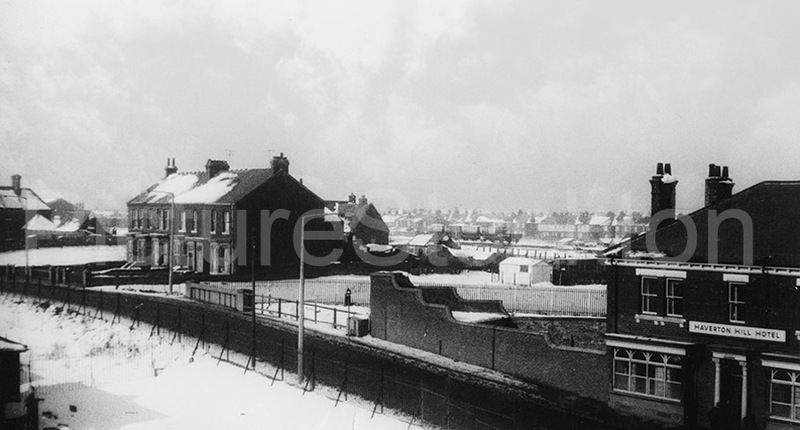 I remember one of the houses in the Picture belonged Mr Moffit the Chemists in Clarence Street. This looks like it has been taken from the ship yard offices, and if that’s the case that would be Haverton in the background? From… George Morris… Yes picture looks like St Johns church on left… My mother Amy Morris (sadly deceased) used to do cleaning in the houses left of Hotel or Top house as we called it.